Private house in Skhidnytsa, comfortable rooms. Ukrainian and Italian cuisines. Skhidnytsa resort, hotel "Villa Alessia"
Private house "Villa Alessia" is a three storey cottage intended for 10 rooms. It was built in the middle of the town and it is near the spring # 8 to which is 300 m. On the ground floor there is a kitchen with a fireplace, on the first and on the second floor are rooms. The hotel sticks the European style as to the interior, service and meals. Villa Alessia has large territory and it includes the playground, chargrill, the summer house. It is 100 m and that is why air is clean there. Hotel "Villa Alessia" is a modern mini-hotel which represents modern conception as to the service and comfort rest. At the guesets' service there are 10 comfortable single and double rooms of different classes. The territory of the hotel has Wi-Fi Internet access. The dining room of the hotel serves dishes of Ukrainian and Italian cuisines. Near the fire place at "Villa Alessia" hotel you can taste genuine Italian coffee and other beverages. The large well-kept area provides places for the outdoor rest. • On the basis of medical and health centers of Skhidnytsa. • Doctor's call for the initial consultation to the hotel or by agreement in the hospital in Skhidnytsa. • Urologist's consultations as well as therapeutist and neuropathologist. • Masseur call to the patient (by agreement). As to the treatment procedures apitherapy is used that is treatment by honey bee products. One of the most popular procedures is a dream in beehives. Hotel "Villa Alessia" offers to rest in Skhidnytsa in comfortable rooms of the following categories: • "Economy", • "Standard", • "Standard improved", • "Family", • "Family improved". The hotel has autonomous heating, cold and hot water is 24 hours. • beautiful views from the window. • windows to the east and north, forest's view. • windows to the north and west, mountains' view. Prices are indicated per room per night with two meals, UAH. Children under six without extra bed are free of charge. For children from 6 to 12 years of age, extra bed (with breakfast) - 250 UAH per night. For children over 12 years and adults, accommodation on an extra bed (with breakfast) is 250 UAH per night. Two meals a day for children under 12 years (breakfast + dinner or breakfast + lunch) - 125 UAH. There are discounts for regular customers. It is offered Italian and Ukrainian cuisines. The cook has an extensive experience in the preparation of dishes of both cuisines. Products are only of high quality. Diet includes meat, milk dishes as well as dishes of vegetables, fruit, different porridges etc. For preparation of Italian meals is used olive oil. There is a delivery of products from enterprises in Italy the owners of which are familiar with the owner of the hotel. Italian coffee in capsules as well as a range of Italian cheese (this service is for extra charge). Christmas dinner is served as well. In the dining room you may always use olive oil. The cost of three meals a day is 195 UAH, children three meals - 125 UAH. It is also possible to order separately breakfast, lunch, dinner and portions for children and dietary meals. Payment is for provided service, dishes is ordered in the morning. A fire place creates a cozy atmosphere in the dining room which can be set on fire in cool weather. • consultation as to the rest. • the use of scanner, copy, it is also possible to use the computer. • a wide range of excursions (direct bus from the hotel). • discounts for regular customers. 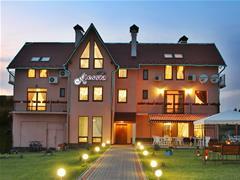 "Villa Alessia" hotel of Skhidnytsa resort welcomes you to rest in the Carpathians! 2013 - 2018. Hotels in Skhidnitsy, "Villa Alessia"
Skhidnytsa, private house "Villa Alessia"